Designs in Machine Embroidery – Article "Headrest Covers"
The September/October issue of Designs in Machine Embroidery has a spectacular cover featuring Katherine Artines’ “Shapely Sunflower.” The theme of the magazine is techniques and technology in the machine embroidery world, and she exhibited the many aspects of machine embroidery. Magazines routinely work many months in advance of the publication date and some magazines publish an editorial calendar that reflects the different themes for each issue. They release it to prospective freelance writers, which is terrific if you are on that list. However, when you are new to freelance writing, you do not have this privilege and have to submit a proposal blindly and hope that the editorial staff finds it attractive enough to include it or put you on their list to submit proposals for the future. Blind proposal submissions are difficult as not only do you not know the theme but also you do not know their timetables. You do not know if you are close to a proposal deadline or if you just missed one. It is just a shot in the dark. The hardest part is waiting many months to hear a response, let alone receiving that rejection, which in the worst case scenario never comes. Designs in Machine Embroidery has an amazing editorial staff and submitting a first-time proposal to them was way beyond my expectations. Personally, I do not believe they would ever ignore a proposal or let one sit for months before responding. To my astonishment, they accepted my first proposal, which happened to be for this issue. It did not include any new technique or technology, but it was unique in that it had a broad base of interest. It appeals to all ages and genders. Many of us drive or ride in cars, so “Headrest Covers” is something that appeals to most and, as it turns out, they are a status symbol in some areas. When my then twenty-something Army Drone pilot came home on leave and asked me to make him a set for his new car that reflected his favorite sport’s team, of course, I dropped what I was doing and started them immediately. I measured his headrests and googled what they look like when you buy them from the professionals and finally came up with an idea and a pattern. He loved his first set so much that he asked me to send him a set that would be for each season’s team. I loved doing it, especially since he was the one that had said so adhamantly, “Sorry Mom, machine embroidery is just not for me!” Huh! We showed him that we machine embroiderers could come in handy. We just needed to think of the right project. Well, in this instance, he thought of it and I am so glad he did because now I get to share it with all the machine embroiderers that read Designs in Machine Embroidery. Machine embroidered headrests can appeal to everyone and with the holidays coming up, I think they would make great gifts. They are super simple to embroider and sew. The trick is finding the right fabric in your local shop. I used fabric that is typically used for swimwear. This gives it the stretch to go over any headrest and adjust smoothly. The embroidery possibilities are endless. You can find the article starting on page 58, and the pattern is at this link. For a behind the scenes of the photo shoot for this project, click on this link to see just a little of what it takes to get a great picture for a magazine article. Personally, when I was making these, I kept thinking that they would bring a car seat into the studio for the shooting. I never dreamed that they could possible do a photo shoot actually in the car. Wait till you see them all scrunched up in that car. Mermaid Magic Design M5165 by Embroidery Library, Inc. I would love to see your version of machine embroidered headrests. Please use the hashtag #TheEmbroiderist so that I can see them. Happy embroidering and thank you Designs in Machine Embroidery for publishing my first article. These DIME goodies arrived with a copy of the magazine and my headrest. I felt like I was officially inducted. John Deer is the driving force behind the website Adorable Ideas and technically, Ultimate Stash is the website that offers the machine embroidery designs. Adorable Ideas is the parent company that also owns Digitizing Made Easy, for which John Deer is really known. To make it even more confusing, do not type in “John Deer machine embroidery” into google or your hits will come back with lots of tractor designs. You probably noticed this, but John Deer does not spell his name the same as the tractor company John Deere. John Deer is a third generation embroiderer. His family began designing Schiffli lace on looms around 1910 and has passed down that skill to John Deer. [Digitizing Made Easy by John Deer, 2007] What an incredible heritage. On the top bar of their website is the Learning Center that includes: Classroom, Inspiration, and Tutorials. All three of these sections will keep you busy learning for a long time. Personally, I love seeing the exquisite gowns made with the Schiffli lace. The designs on the Ultimate Stash website are a very high quality. You can tell that it comes from many years of experience, but it is most evident when you click on the lace designs. They are gorgeous. This is really authentic Schiffli lace that is available to every home embroiderer. Before my husband bought me my embroidery machine, I never dreamed that I would have the ability to create such beautiful, authentic lace. It has been such a joy to me to find this site. My favorite purchases are from his “Vintage Lace Project Series” hosted by Janet Carley. These lace projects are so elegant. You learn professional methods of using the lace designs on projects. I am not sure if they are still available as I could not find them on the website any longer. I now wish I had purchased all of them. The website does have many designs that are not lace oriented. They have a free design for you to try. 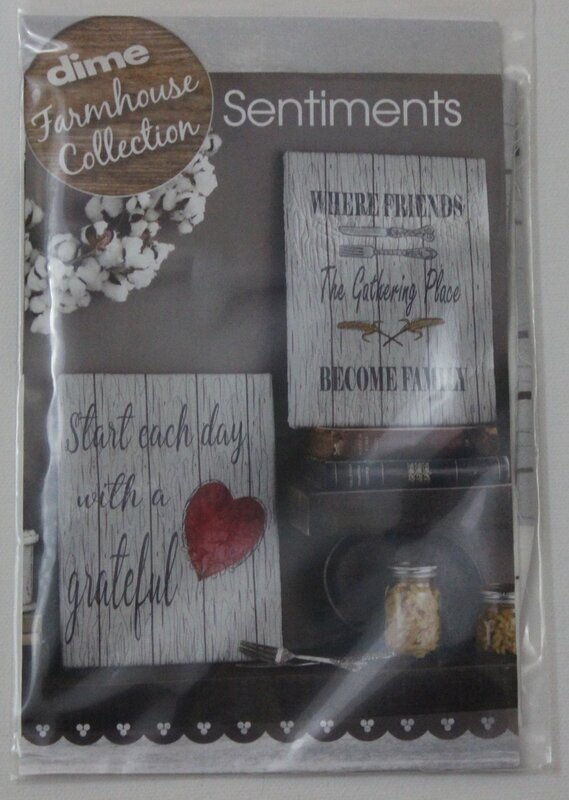 In addition to regular designs, they specialize in “Sparkle Designs;” and they offer kits as well to accompany the designs. This bride and groom lace motif is just lovely and makes a wonderful wedding card or can be added to even an anniversary gift. Have fun machine embroidering and I hope you enjoy the Adorable Ideas website. Lace is incredible to make on an embroidery machine. It is so gorgeous and so easy to sew. It uses a technique called free-standing, which basically means that the design does not need it to be embroidered onto fabric. It is embroidered on a stabilizer that is water-soluble. It washes away and only the threads remain. The digitizing for free-standing lace is a different technique than for regular designs. Each thread must connect to another thread and they must build upon each in order for the threads to not separate when washed. This technique is difficult to master and it is where you can tell a novice from a master. 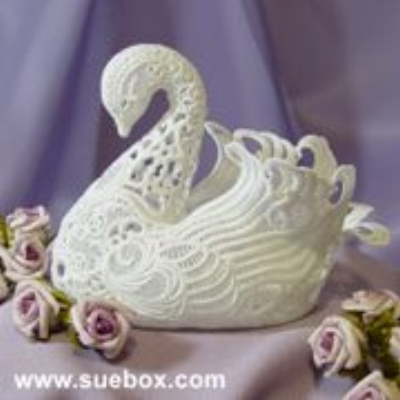 Sue Box Creations is a website from Australia that specializes in beautiful laces and exquisite designs. She offers a variety of free-standing laces that can be made into doilies and hankies, as well as traditional galloons. While galloon laces are traditionally sewn free-standing and then sewn along the edge of a garment, they can be sewn directly onto the garment. This is especially useful when it is a child’s garment that will used for every day use or as in this case a blue jean garment that is used around the house for every day chores and gardening. It withstands a lot of abuse and has held up over the years because the lace was sewn directly onto the front of the jumper. This way it cannot snag or get caught on anything while I am working. In my mind, there is nothing like her 3-D swan. It is so awesome and so impressive to give as a gift. People will not believe that it is all thread. We have made several of these swans that take many hours and lots of thread to complete, but they are worth every bit. The picture below is from their website as we did not keep any for ourselves and did not take a picture before we gave them away. Of course, I will have to fix that soon. As you can tell, they are just as much fun to give-away as they are to keep. As with great machine embroidery digitizers, she has free downloads. There are currently thirteen free designs that show off her talents and one template. I personally just love the detail of the dragonfly. If you love 3-D lace or are just curious on how it works, she has a free lace motif that when sewn together creates a lovely 3-D bowl. It takes 6 of the triangles to make one bowl. You sew them together by hand or with the sewing machine. She has instructions with the download. Make sure that you sign up for their newsletter as they offer complete CD’s with free shipping for half off, free designs, $1 and $2 designs, and many other wonderful offers. Hope you enjoy these designs as much as I do. Martha Pullen Company is known for many wonderful things in the sewing world. I think heirloom sewing and Martha Pullen's former magazine, Sew Beautiful, would be first in most people’s minds, but they are equally known for their exquisite machine embroidery designs. They have two ways to purchase machine embroidery designs. The first is the standard way of searching for a design on their website and downloading it or having it sent to you in the mail, but they also have an incredible embroidery club. The embroidery club has an abundance of gorgeous designs for a set price. At $69 a year, it is a wonderful deal. In the years past, you received at least two alphabets, a total of nine sets of designs to start the membership, and then at least two designs each month. The design sets have included exquisite christening gown designs, smocking in-the-hoop, Christmas ornaments, baby booties with matching bonnets, and so many other designs. In addition to their designs, Martha Pullen Company offers videos and classes on how to machine embroider. My all time favorite design from Martha Pullen Company is their free-standing lace nativity ornaments. They are just beautiful and stitch out so precisely. I just love making and giving them every year as gifts. In case you are looking for them, they are still available in their 2013 collection. While you are at it, if you are not familiar with heirloom techniques, you may want to add them to your repertoire. Martha Pullen is the originator of French hand sewing techniques on the sewing machine. At first glance you might judge them to be all skulls and tattoo type designs, but look a little further and you will find something for everyone. While they may have a very hip culture, they also are very diverse. They range from a typewriter letter font to a gorgeous lace envelope to heraldic lions to French Napoleon bees. They even have unique wedding designs. These designs just do not get any better from a style as well as a quality perspective. In addition to offering high quality and versatile designs, they provide a great “Lookbook” gallery and tutorials. One year my teen boys loved the non-traditional placement of designs on their T-shirts that had been featured on the Urban Threads website. This website keeps me up to date with the latest trends that really surprise my children. Signing up for their newsletter insures that you will be able to take advantage of those wonderful sales and keep informed on all the latest addition of designs. However, it will not keep you up on the freebies. You will have to check periodically for those. Have fun surfing through this great website and do not forget to try one their designs for free or on sale. Machine embroiders have the unique ability to create one of a kind projects, but they also have to ability to have access to quality embroidery designs that are only available to the elite of the fashion industry. Zundt Designs is one of those high-end embroidery designers, which also has a long legacy with the historic embroideries of St. Gallen, Switzerland. Zundt Designs is known for their exquisite lace. They have every kind of lace your can think of such as motifs, corners, jewelry, ornaments, 3-dimensional, and of course, the traditional galloon. The typical machine embroidery design is always realistic and highly detailed. They range from animals to children designs, but their precision flourishes in their vast flower collection. Zundt has a unique project section entitled “Adorations.” It showcases their gorgeous designs in projects. Each project has designs and design workbooks that fully explain the projects and demonstrate how to use lace like the professionals. These projects encompass a vast breadth of areas from garments and quilts to window treatments and tablecloths. As to be expected, the alphabets designed by Zundt are impeccable and follow the lines of elaborate historical fonts. Any one of them would make a monogram that would impress even the hardest to please. To allow machine embroiders to test their superb designs, they currently offer three designs for free – a beautiful rose bud, a lace bow, and a free-standing lace ornament. All three are just wonderful and are a delicious taste of their other elegant designs. Hope you have fun trying them. What is the one thing you would want on a deserted island? Ask ten people that question and you will get ten answers. "Desert Island" Image courtesy of Wikipedia. Honestly, how can you ever answer that question. Just thinking about it can boggle your mind. Well, in my fantasy world, my deserted island has running water, electricity, and of course, an embroidery machine under a palm tree. (Did you see it all in the photo?) What more could I ask for? Unlimited blanks and designs! Embroidery Library, Inc. would be one design supplier that would be able to keep me happy on my deserted island. With over 100,000 quality embroidery designs, how could I ever run out? Can you imagine how many designs that is! In a hundred year period, I would have to embroider over 2 designs a day just to use them all. Now granted, not all of those are unique designs. Some are just size differences, but even if you take that margin off, it still leaves you with a lot of designs. These designs seem to fill most of my needs when I am thinking of a project. They seem to have every style imaginable: filled, watercolor, red work, black work, sashiko, trapunto, embossed, free-standing lace, applique, in-the-hoop, etc. Personally, I cannot think of a category in which they do not have an embroidery design. While their designs are of the highest quality and they offer so many, you would think that would be the end of it. However, they far exceed our expectations as they are also an educational website. Do you need to know how to embroider on velvet, paper, or that ever so popular toilet paper? They have it all explained in their “Projects” section. The “Projects” section has a wealth of information. Think of a project and it is there with a complete description of how to complete the project with the appropriate types of fabric that work well with the specific designs, the best stabilizer, threads and needles. The “Fabric 101” section is my favorite. I have never needed to buy expensive embroidery books or take classes because this website was right at my fingertips. It is books and classes on machine embroidery all wrapped up in one nice spot. As to be expected of their professionalism, they have a weekly newsletter that highlights their latest additions to the library and includes the wonderful weekly sales. The best part is that every month they offer free designs, which is from their normal library of designs. They are not simple or watered-down designs, but actual designs that are normally for sale. Welcome to Website Crush Wednesday – a new series for machine embroiderers. This week is just an introduction to the future series because the first website is a biggie. It has such a wealth of information that it will take a very long blog post to cover. Each week (hopefully) a new machine embroidery website will be featured. There are so many great websites out there and so many that need to be discovered. Probably in the beginning you will be quite familiar with the websites, but for those of you who are new, maybe not. To be honest, I will only review a website that I have personally tested one of their designs. This is to make sure that the designs themselves are high quality, which is a topic for another blog post. The website must have a good reputation and sell original designs. Initially, I will focus on freestanding shops that produce their own designs in house. Is there a website that you go to regularly or on special occasions, please let me know about it. I would love your recommendations. Maybe you are a shop owner and would like to be featured. I am open to your recommendations also, but I will make a disclaimer that I was contacted for review. All the commentary will be my own and there is no compensation involved. I would love to know your comments as well. The best part is that eventually I will publish a list of all the websites reviewed and you can use it to click on or to remind yourself when you are looking for a particular design. So until next week, happy embroidering! Machine embroidery is so much fun and part of the fun is playing with all those threads. Recently, I made my college daughter a Mexican flower peasant blouse that had 53,877 stitches using thirteen different bright and neon colors. I had so much fun organizing all those threads. Many machine embroiders use these wooden or plastic spindle type racks to display their vast assortment of threads, aka, their stash. I also use this method and have several to keep them all sorted by color, but I also have one wooden "June Tailor" rack that is collapsible. I can conveniently fold it away when I am not using it. It holds thirty-four different spools, allowing me to sort that many thread jumps. Personally, I have never had a design loaded into the machine that was more than that, as I have always had to re-hoop to get that much onto my surface. Most embroidery machines today have the capability to show the sequence order of the thread jumps. This is such a wonderful feature and allows you to keep everything organized by referring to the sequence number on the machine compared with that on the design sheet and then keeping the threads in the same order on the rack. Checking and rechecking all three constantly makes for a perfect stitch-out. Inevitably, the threads will be used more than once. There is the dilemma - what to do with that open space. You could just leave it open, but then you run the risk of loosing track of your placement, or if you are like me and have accidentally purchased the same color twice, you could use the duplicate. However, it never seems to work out that that is the color that is duplicated and you are still left with that gapping hole. Dixie cups to the rescue! Those Dixie cups are the best! You turn them upside down and write on the number of the thread color on the bottoms that should be next in order. Voila! An inexpensive placement marker and you will not loose your place again. The best part of those cups...they can be filled with your sweet pick-me-up when not in use. What is the most unusual thing you use in your sewing room? One of my college daughters asked me to make her friend a flower headband. Since my daughter also machine embroiders, it was so much fun to be facetiming while looking at machine embroidery designs at the same time. This truly is a wonderful technological age! Who would have guessed that you could see your daughter who lives over 800 miles away and still go shopping all at the same time – let alone, be planning for an embroidery design that will be stitched by a machine! Sometimes it just boggles my mind! We settled on a free standing flower design by Sonia Showalter, entitled “Sunflower Beads.” It is a very versatile design and can be stitched in any color combination. My daughter chose white with a single grey center. It was designed with a three-color combination – one for the petals and two for the center design – with two parts to the flower. There is an upper and a lower part of the flower. The bottom flower has a loop on each side where a ribbon can be threaded through, which is the main reason why we picked this design. It was cute, the right size and could be simply made into a band by looping them together. Perfect! The instructions state, “When completely dry, the flower pieces need to be glued together before stringing.” Ugh! This is machine embroidery! Surely we can do all this in the hoop and skip the gluing phase. There was my challenge! So here it is. Here are my instructions for machine embroidering the two flower parts together without gluing them. For this project, I used Floriani’s water soluble stabilizer, “Wet N Gone.” This product is not the plastic type of stabilizer, but has more body like a true stabilizer. I used two sheets in the hoop initially and then I added one more sheet in step 8. Follow Sonia’s instructions to machine embroider all the “bottom” flowers first. Trim the threads at this time. Wash them and set them aside to dry overnight. Follow Sonia’s instructions to machine embroider the “top” flowers next. However, stitch colors 1 and 2. STOP before stitching color 3. If you are stitching several flowers in one hoop, you will have to carefully watch your stitch out and advance your machine manually from color 2 in one flower, back to color 1 in the next flower. Trim all the threads from the top flowers at this time. When all the flowers are stitched for colors 1 and 2, advance your machine back to the starting point and then advance it again so it begins at color 3 of the first flower. Take your hoop out of the machine. TIP: I have a tall, but medium sized cardboard box that I use for spraying with Sulky KK 2000. I put the item in the bottom of the box to spray it and then all the sticky mist does not get onto everything. I keep the box folded up against a wall so it does not take up any space and it is readily available when I need it. Cut another piece of water soluble stabilizer larger than the size of your hoop and lightly spray it with the Sulky KK 2000. Place it sticky side down on top of the flower sandwich that was just created. This will keep those bottom flowers from getting caught in the feed dogs or any other openings. Finger press this down very securely. Carefully, put the hoop back into the machine. Stitch ONLY color 3 for each flower by advancing the stitch order manually on your machine. You are now done with the special instructions. You can remove the hoop, trim the threads and wash the away the stabilizer. The flowers were threaded all together with fold-over elastic and tied with a simple knot to keep it together. This headband is such a fun spring project. What will you be making to celebrate spring? Every occupation has it tools and machine embroiderists are no different. Just like hand embroiderers, machine embroiderers use hoops to keep the fabric taut. As hand embroiderers know, sometimes it can be quite difficult to tighten the screw to make the fabric as tight as a drumhead. This precision can make all the difference in whether the embroidery design is a high quality or just fair. The embroidery machine manufacturers know how critical this is and want their superior machines to always shine even when the embroiderist may be lacking the strength to tighten that hoop, thus they have been providing hoop screwdrivers for years. However, this last upgrade produced a new device that was quite innovative. They now provide new embroidery machine owners with a multi position screwdriver. The screwdriver technically has three positions, and all three positions can be used to tighten the the hoop, but only position “3” grips the screw and does not allow it to slip, so this is the best option for tightening the hoop. Position "1" is designed primarily for tightening the needle or the feet. Whereas, position "2" ideally was made for the screws in the metal plate around the feed dogs. The previous screwdriver looked like a flat piece of metal. Inevitably it would slip while tightening and was difficult to get a grip. However, the old screwdriver is still great for all the other functions, because it gets into the small spaces so nicely. You can own the multi position screwdriver without having to own the newest embroidery machine. They are fantastic. No more sore fingers! This new screwdriver is a bit pricey to buy at the retailer, but it is worth every penny. What do you think of the multi position screwdriver for embroidery machines? Sewing Machines are so sophisticated today. Back in the dark ages – well at least when my husband bought my first sewing machine as a wedding gift almost forty years ago (He was so loving and thoughtful. How could have he have known it would lead to this. ), sewing machines were much simpler to repair. Everything opened up and came apart. Even the manual told you how to repair it. You were just expected to repair it yourself. Today, the sewing machines are so complicated. They are computerized just like our modern cars. The sewing manual is a tome and it does not even address repairing it. I have asked my beloved sewing machine salesman/owner/repairman if he would tell me how to open it up so that I could make sure that I did not have an illusive thread floating around when it breaks, but he assures me that I would forfeit my warranty and that I should just bring it in any time I have an issue. Who wants to forfeit that incredible warranty and yet I do not want to drive an hour and fifteen minutes to his shop (yes, his price was well worth the savings, service and training). As I was embroidering the muslin bags to keep our church’s baptism towels from getting dirty while they are stored, that upper thread broke for no apparent reason. It sprang up into the upper thread tension area and balled all up. I could see its gold little head peeping through the little crack. I searched for my tweezers. UGH! One of the boys took them. I hid my eyebrow tweezers and did not think they knew to look for my sewing tweezers, but at least they know not to take those scissors! Of course, after realizing that the boys uses them, I decided to just buy new ones and never ask what they were used for because I really do not want to know. Thankfully the edge of the thread was barely peeking out of the crack and I could pull it ever so gently by hand. Oh, so tenderly. I knew it could break inside. I pulled. It slowly began to unwind. Not what I wanted. I wanted it all to just lift up and stay together. Gentle! Gentle! It was coming. It broke! I could see there was some still in there. Nothing would fit inside the crack that had the ability to grab. I did not, under any circumstance, want to break the plastic casing. It was not worth it. Using the iPhone to look up the in the upper tension area to see the thread ball. Modern technology could help me out, but how? I had to think like a surgeon. I wanted to look inside and magnify it. If I used my iPhone to look under the plastic casing and it would show me where the thread was and then I could use it to look inside the crack to see if it was still there by magnifying it. It worked. I finally got it out and now it is running just fine. How has your iPhone gotten you into places you never thought you could see? Machine embroidering plush towels can be a challenge, as they are very difficult and sometimes impossible to hoop in a traditional manner. No matter how hard you try, when you put that thick terrycloth between those two rings, it pops out when you fasten it down. If your terrycloth is a thinner grade or has been washed many times as my test sample was, then it is not a problem and can be hooped like other fabrics. There are many ways to conquer this problem, but here are the three easiest. All three options use a sandwich approach, which consists of a bottom layer of water soluble stabilizer (this differs depending upon the method chosen), the towel itself, and then the important water soluble topping stabilizer which serves to keep the pile of towel down so it does not get caught up in the needle or the foot as it travels across the design, but it also keeps the pile down while actually embroidering so the design is very uniform. It really makes a difference by using this topper. It takes the embroidered finished product from amateur to professional. The first option for hooping the towel sandwich is to purchase the Snap Hoop Monster from Designs in Machine in Embroidery, if you have the time and the funds for the purchase. This magnetic wonder solves all your problems and is the easiest solution. You lift the top magnetic hoop, line up your towel sandwich of water soluble tear-away stabilizer, towel and topper, then put the hoop back on top. Presto, no further issue. It is an amazing invention, by a very creative lady, Eileen Roche. I have the 5 x 7 model and it is fantastic. It is worth every penny, but I chose not to purchase the largest hoop, which I am now regretting. It is on my wish list for sure. The design I chose for these towels is larger than the 5 x 7 hoop. I could have opted to split the design in half and then hoop it twice, but I decided against this method as I thought it would take me longer in the long run. The next two methods are similar in that you hoop a tacky or pressure sensitive stabilizer instead of the water soluble tear-away used with the Snap Hoop Monster, in between the two rings and then stick the towel to the stabilizer. This is another amazing product that I do not know how we lived without. It is easiest to hoop the stabilizer before removing the protective paper as it is very difficult to hoop it tightly since it will stick to the top hoop and not allow you to readily tighten it. Also, it will leave a residue on the the hoop. This process solves both of those issues. Once the stabilizer is hooped, you lightly score the paper with scissors being careful not to push too hard as it will cut through the actual stabilizer and you will need to start all over again. Thicker scissors seem to score better than thinner ones. Maybe I just apply less pressure. Once it has been scored, remove the protective paper being careful not to touch the stabilizer. Finger prints and score marks on the tacky stabilizer. Then align the towel onto the stabilizer with both rings of the hoop under the towel. It seems counterintuitive, because it looks like the towel is just floating on top of the hoop, but with these next two steps it works really well and this is were the methods differ. This towel has a border that can easily be used to line it up with the edge of the hoop. You can see the hoop placement in the right corner. This topper must be secured to the sandwich. It can be done in many ways such as basting it by hand or machine to the towel before it is attached to the sticky stabilizer or it can be done after it is attached. Most machine embroiders opt to baste after and use the built-in basting feature on the newer machines. With the click of a button it adds the basting lines and knows to sew it before the design begins. On the Baby Lock machine, basting is simply added automatically at the beginning of the process by the press of a button. The hard part is keeping it secured while it is basting. I have seen some embroiderists hold it in place with their hands, but I strongly do not recommend this method.and yes, I have tried it. You know those times when you are in a hurry and you want to skip a few step. It never pays. The second method is to pin it in place, but it is difficult to get it taunt and to especially get the pins to go down and back up without loosening the stabilizer. Topping pinned to the towel and underlying stabilizer. The third method is the method that I chose. Use a tacky water soluble stabilizer on the bottom, with the towel in the middle and then spray the towel with a temporary adhesive (I used Sulky KK 2000). Once the towel is sprayed, I affix the topper directly to the towel and smooth it out by pressing in the middle first then working out and down firmly, so all the air bubbles are removed and it creates a nice tight suction with the towel. If you misplace it, the nice part is that is lifts right up and you can reposition it, starting all over again. The basting keeps the topping in place and taunt while the design stitches. Now you are ready to baste and begin your beautiful design on your towels. This Sunday our church is having a baptism that will now have six embroidered towels for the occasion. What method do you use to machine embroider plush towels?